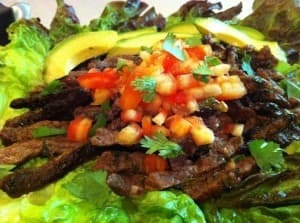 Vibrance Nutrition and Fitness | Tasty Sunshine Inspired Recipes! You are here: Home » Blog » Tasty Sunshine Inspired Recipes! Place the marinade ingredients in a large bowl and whisk together until well combined. Place the flank steak in a resealable plastic bag and pour the marinade over the steak. Seal the bag and lightly squish the steak around to make sure the marinade covers all of the meat. Put the bag in the fridge and allow to marinate overnight or for a minimum of 6 hours. Prep the vegetables as directed above. When you are ready to cook the meat, remove the steak from the bag and discard the excess marinade. Grill the steaks on medium-high heat for about 7-10 minutes each side, depending on the thickness. Allow the steaks to rest for about 5 minutes before slicing. Make sure to slice against the grain. Squeeze the fresh herbs or rub the leaves to release the natural aromatic oils. Place into a glass pitcher. Add fruit and muddle the fruit and herbs using a wooden spoon or muddler. Pour water over the herbal fruit mix and add ice. Keeps for 2-3 days. 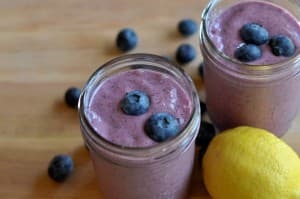 This smoothie gears you up to have an awesome day! Packed with protein, low glycemic fruit and fiber, it supplies the body with ample energy and stamina to get a couple of good summer adventures in before lunch! Click on the link below to print out these recipes (and a few more I included!) and take them with you! Download VIBRANCE Summer Recipes Here!